Pubs: Then & Now: #248 Wynnstay Arms, Llangollen, Denbighshire : 2007 to 2018 (RIP?) And A Flock of Seagulls Member! #248 Wynnstay Arms, Llangollen, Denbighshire : 2007 to 2018 (RIP?) And A Flock of Seagulls Member! Our boating trips to Llangollen are quite infrequent, but is is a great section of canal to travel along. 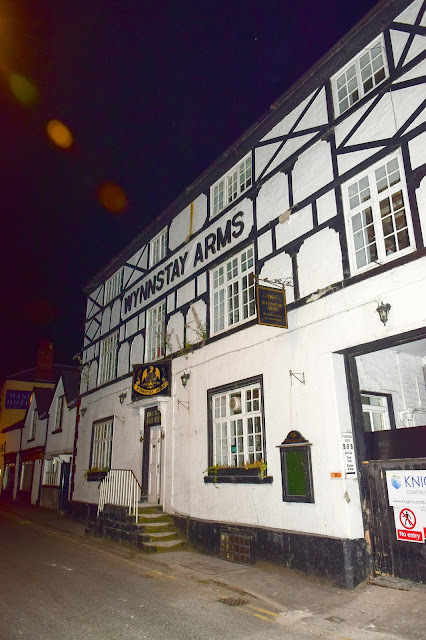 The town of Llangollen has some interesting pubs (see previous entries) and I'm surprised that the Wynnstay Arms hadn't featured before. We didn't go into the pub on our first visit in 1996, but we did venture in on the evening of Friday 31st August 2007. Our next visit to Llangollen was at Easter in 2014 when we hired a boat from Chirk Marina. This visit was on the evening of Saturday 19th April 2014 and, as far as I could tell, the Wynnstay Arms was unchanged (outside or in). On our most recent visit to Llangollen, on the evening of Friday 31st August 2018, this was the scene. We'd already had a couple of pints, a meal and approx a bootle of wine (each) and were looking forward to seeing whether it was still a proper little boozer. At first glance it looked remarkably unchanged...but the closed front door is a bit of a giveaway (this was 10:40pm). Somewhat disappointed, my friends headed off to the Bridge End Hotel (where we'd started our evening) and this is where my evening turned into a somewhat bizarre experience. As I was taking my pictures I got into conversation with a scouse gentleman who was having a fag outside the wine bar next door to the Wynnstay Arms. I think he started the conversation (but I'd had a lot to drink so don't really remember much detail!) by telling me his name and that he was a member of the band A Flock of Seagulls. I didn't recognise him and, quite frankly, I didn't really believe him, but I carried on chatting with him because...well, I'll talk to anyone! (And I quite liked A Flock of Seagulls, back in the day.) It was his idea that I take the picture. Later, after a quick check on the internet, it looked as though I might have been talking with Mike Score who was the lead singer with the band. Subsequent research, back home proved that it wasn't him as he now has an American twang to his voice. 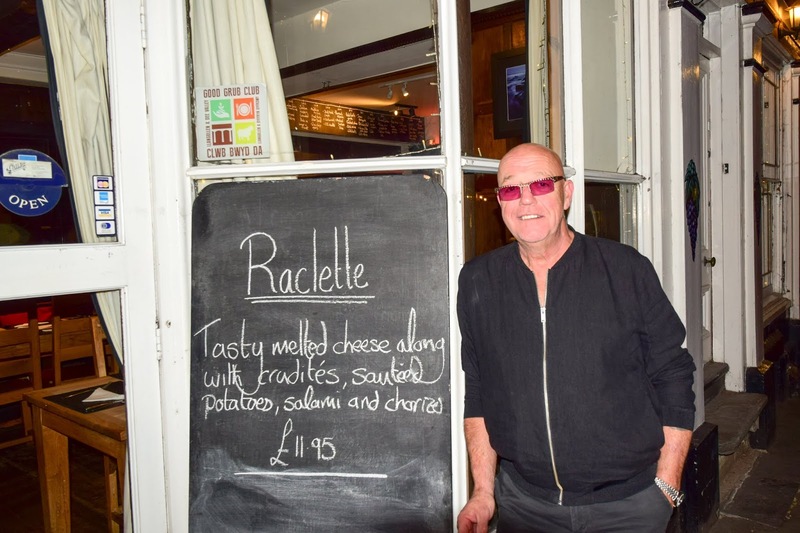 I finally found a recent interview with the whole band and there he was...Frank Maudsley...in the same shades, wearing the same watch and crucially with exactly the same voice. Don't ask me what he was doing in Llangollen, because in my pissed state I couldn't remember! Anyway, back to the Wynnstay Arms. Subsequent research shows that it is to be refurbished "to transform it into a destination bar, restaurant and cocktail bar" as outlined on the Welsh Government website. Whether this actually goes ahead is anybody's guess, but hopefully it will continue as a drinking establishment in some form. Peter Allen. Watermark theme. Powered by Blogger.